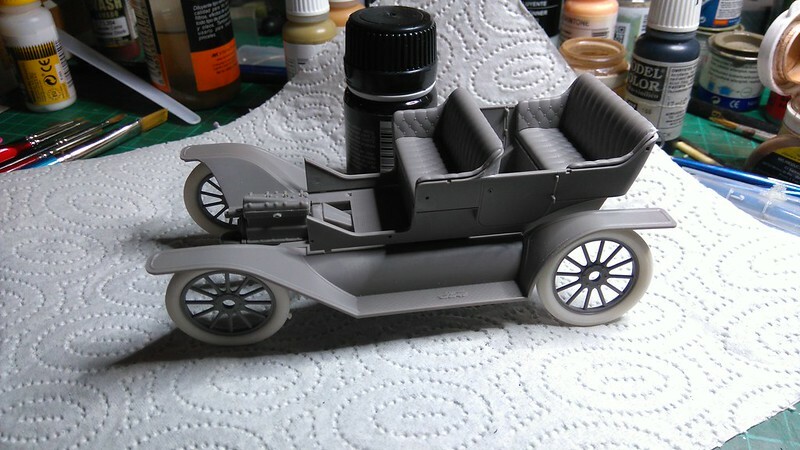 I have started building the Ford T Touring, from ICM. Most parts have come together nicely, the seats however took a great deal of fitting, to get an acceptable fit. 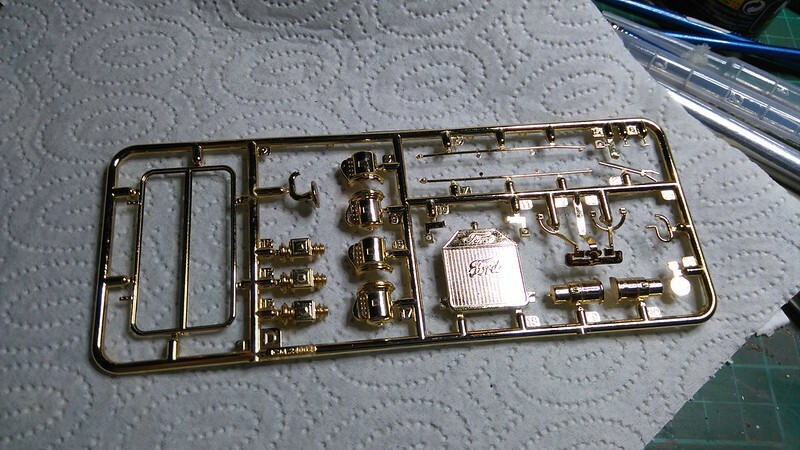 The brass plated parts will be a bit of a challenge. The plating peals of far to easily, so it will be difficult, if not impossible, to keep it. I have testet other options. First one, was AK-Interactives extreme metal brass. This one work fine in the air-brush, but dries rather flatt and even with a gloss coat does NOT look like brass. Will try it again though. Perhaps a gloss black basecoat will give it more of a shine. Next one I tried was AK-Interactive true metal brass. This one was diluted and brushpainted. This one was no good either. The brush applied paint was not even enough and some of it came of, when beeing polished. The true metal brass however could potentially be used for a well worn down brass look, in future builds. Not quite sure how to deal with this one yet. Great progress Jesper. I've looked at this kit in the LHS several times and it is good to see one being built up. You seem to have overcome the issues with the seats very nicely. Have you tried the AK Interactive True Metal wax? I have seen some great results using this product, but haven't tried it yet. 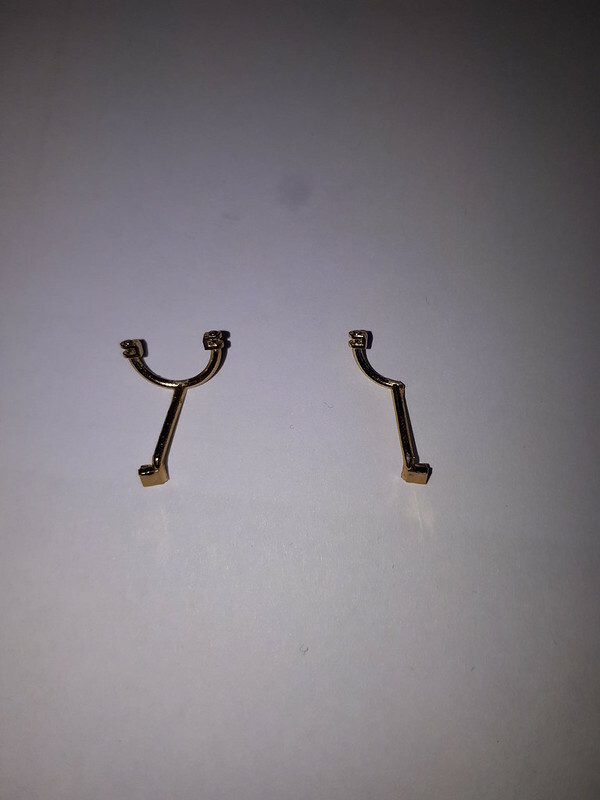 It might be worth looking at for the brass parts. I've used Bare Metal Foil on classic car builds. Gold for the brass. Of course it looked more gold than brass but it looked better than any paint could ever look. 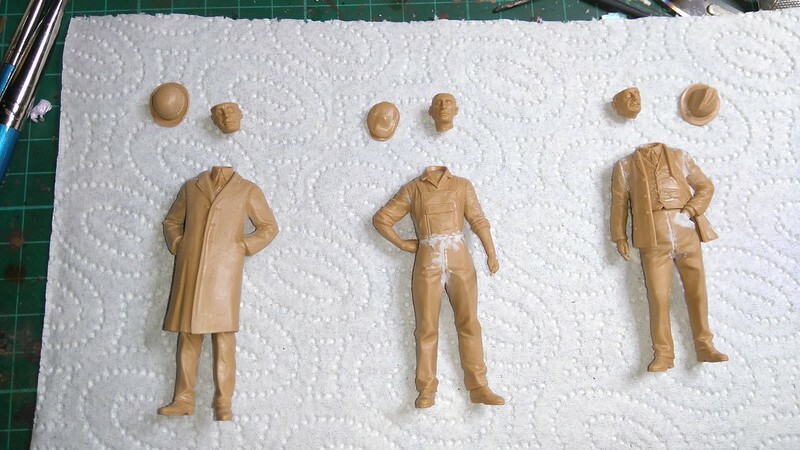 I haven't done any work, on the Ford, during winter, but have preped ICM's "Henry Ford & co" 3 figure set. Haven't yet decided how I will use these figures. I've got good results with MM Gold leaf but the problem in my climate is that fades away in a few days if not over-sprayed with some clear (Johnson's doesn't work - it makes the things worst). Mix some silver for "brass" or some red for "copper". I'd like to see these figures painted. What are the tires made from in this kit? Thanks for looking in guy's. Kosprueone: The tires are rubber. Had a minor setback. 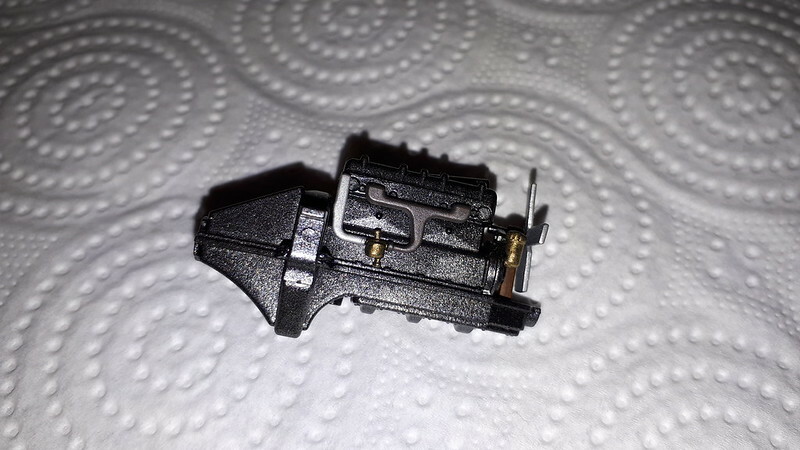 One of the brackets, for the headlights are missing an "arm". Since the area, where it should have been, is plated, it must have happend during production. I have been in contact, with ICM. They will send me a new sprue. Nice start to a true classic. As far as an option for Brass, Testors in the little bottles which are enamel based makes a really nice Brass color. I even own a bottle of the stuff. also Model Master Acrylics has a Brass paint, but I truly hate their Acrylics as they basically stick to nothing including their primer which never stuck to the plastic very well to start with. A few weeks ago, I received a package, from ICM customer service. Unfortunately it did not contain replacement parts, for my Ford T, instead there was a canopy, for an airplane model. Quite far, from headlight brackets, I would say. 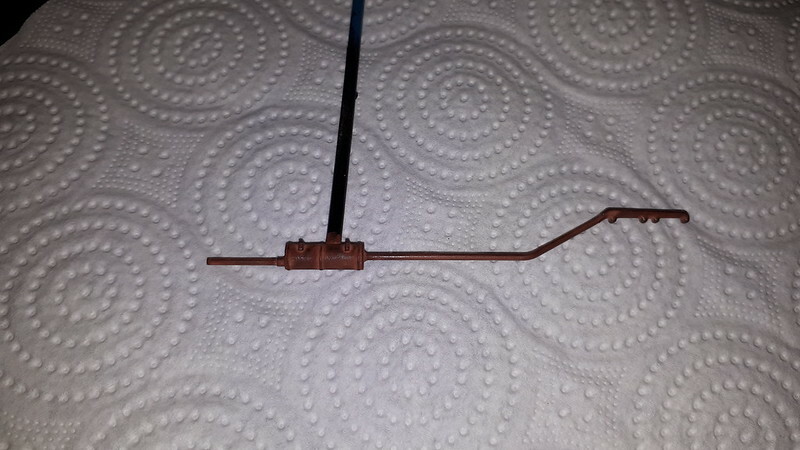 Another email, to Valeriia, in Ukraine, who promised to send the correct sprue. As promised, another parcel was send, which I received late last week. 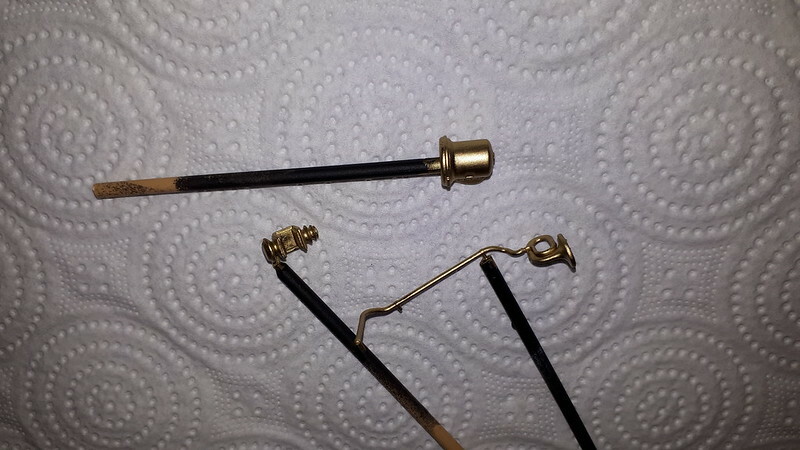 So now I have the "Old" sprue and the replacement sprue, which gives me the oppertunity to experiment, with various brass effects. So I'm back, behind the wheel, of the Ford T.
I just couldn't make my mind up, what to do about the brass plating. I have now stripped the brass plating and have given most parts a dose of AK true metal brass. The exhaust system, painted in flatt black, then two coats of AK dark crusted rust, finally rubbed with metal pigments. A little woodwork as well. Painted in oil over acryllics. Finally the body. Black and maroon combo, using Tamiya spraycans. The AK Brass over gloss black really looks quite good. And that crusted rust looks as real as it can get. Your repainted engine looks really good especially the block. Did you try any google searches? All nice stuff here, Jesper, but I particularly liked the wood grain effects. Do you care to share your method? I have an interbellum Ford coming next. Lovely work all round Jesper, a variety of products and techniques that will come together beautifully in the end. This is really progressing well mate. Thanks for looking in gentlemen. Joel: I have been diging, for info regarding colors. From what I have been able to find, it apears that Ford offered, several colors, in the first few years, then found a new, cheaper way of painting, which, at the time, could only be done in black, so for a number of years, black was the only color available. At a later stage several colors were once more offered. I havent been able to dig up information, whether they had a shiny finish or more to the dull side. My choice of colors was, most likely, not available in 1911, but I like the color combo and have chosen to keep it on the shiny side, though not too shiny. Thanks Damian. Glad to be back working on this one. Gabriel: It's quite simple actually. 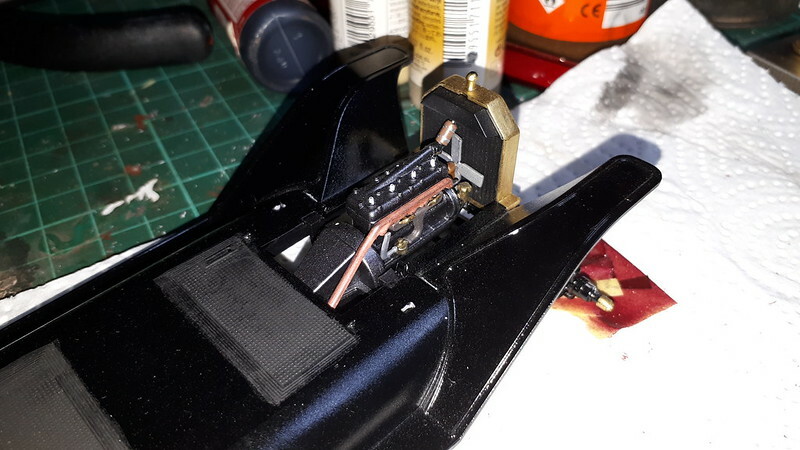 First parts are primed in flatt black, then a layers of acrillycs are added. I made a mix of beige and yellow. The acriyllics are brush painted and deliberately painted with visible brushstrokes. Not only brushstrokes, but the black primer need to be visible as well, more or less in stripes. when the acryllics were dry I wasn't to happy with the amount of black stripes, so I aded a few more black stripes. I used burnt sienna oil. The oil paint is semi transparent, so the acryllic layer and primer will be partly visible. The primer and acryllics will help create the grain. Don't be to worried about brushstrokes, when adding the oil, it will only help creating the wood grain. When adding the oil paint, you can create different hues, by varying the thickness of the oil paint. What acryllics and oil's to use really depends on what type of wood you need to replicate. 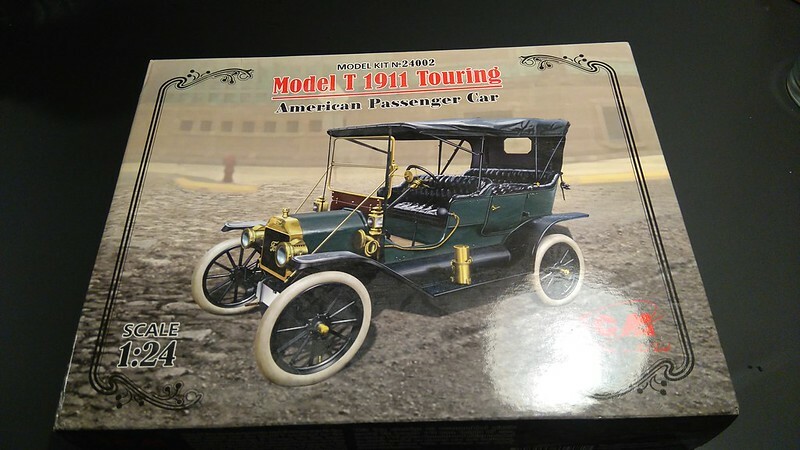 I done almost no research on the early Model Ts, but I've seen a few documentaries on Ford, his Model T, and his greatest invention; The Assembly line. While none has gone into much detail about paint and painting processes, for some reason I just remembered the one and only comment I can recall as to color. Any color the buyer wanted was fine, but only Matt Black is the only color that the T's were painted. you explanation as limitations of the process makes a lot of sense to me. Have done a bit of work on the lovely Tin Lizzie. 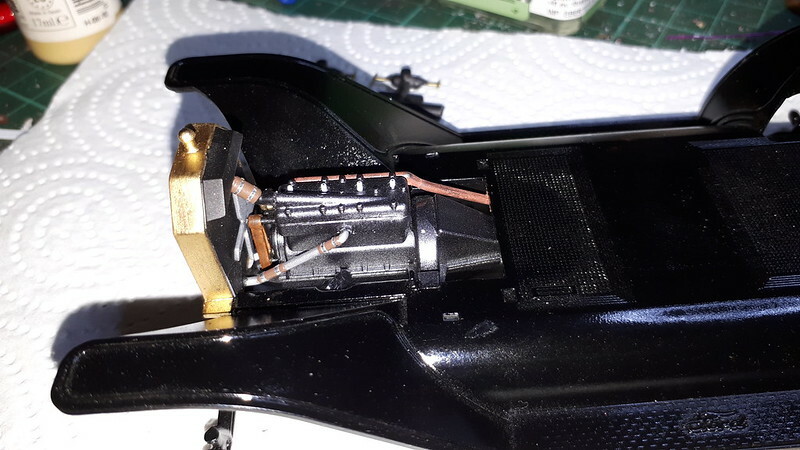 Engine assembled and glued in place. 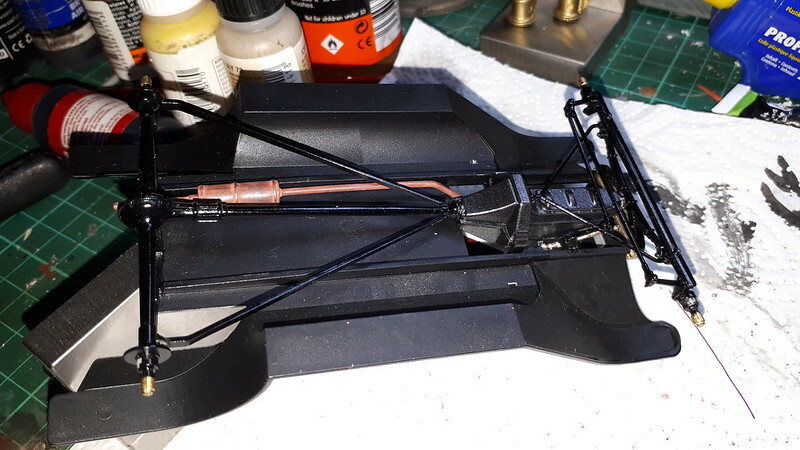 Undercarriage assembled. 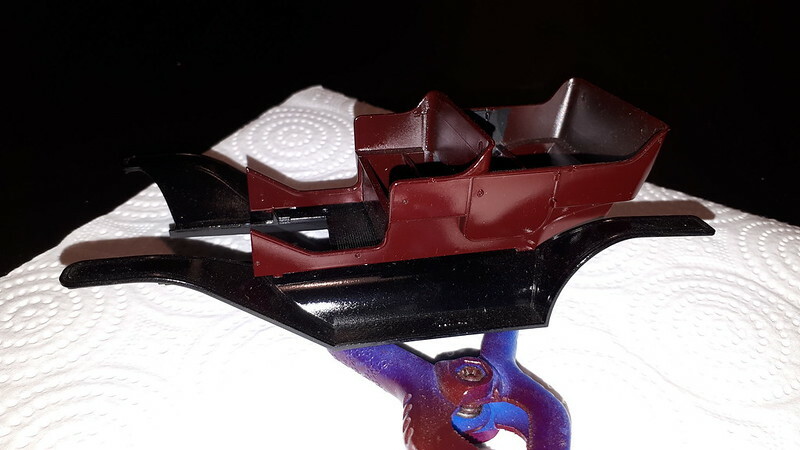 The few pictures, I have been able to find, shows the bottom of the car the same color as the top, with the same glossiness. I decided to paint the bottom a flat black, for a little tonal variety. Later on I found out, that maybe part of the bottom were made of wood, which would have given the opportunity to make the bottom a bit more exciting. Unfortunately I could not get this verified. So here it is, in all of it's non glory. 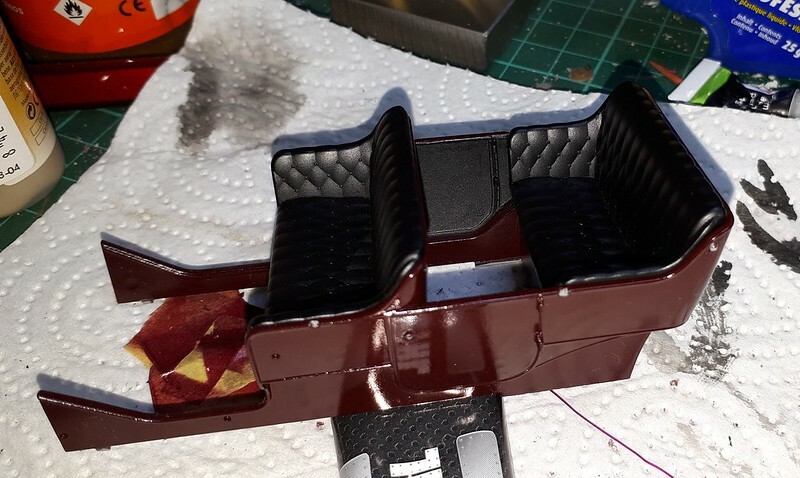 Seat's have been glued in place. She's really coming together quite nicely. Mr. Ford would be real proud of you. From what I can see of the Brass, you got it looking really good. This build is really starting to shine now Jesper, we really don't see enough of these early classics built up. As Joel said, that brass finish is impressive, a great highlight. Another Woodgraining method that I have used which can work well on these flat surfaces is to give the part a random few swipes with coarse sandpaper, not in a consistent straight line, to create fine swirling grooves in the surface. 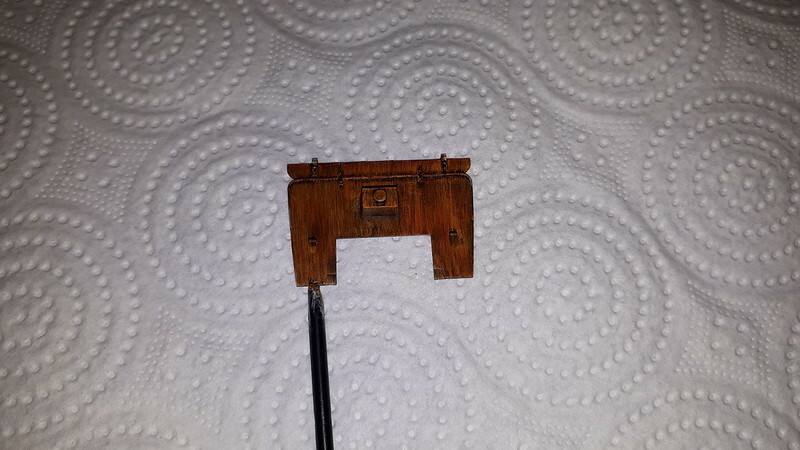 Once you paint the base colour, you can then use several colours of thin wash which will "pool" in the surface imperfections to give the various grain colours. You can build this up very easily. Hans, Joel and Damian, thanks for looking in, much appreciated.